Ellison Firebrandt fights the good fight for Earth. Under a letter of marque, he raids the ships of Earth's opponents, slowing down their progress and ability to compete with the home system. On the planet Epsilon Indi 2, he rescues a woman named Suki Mori from a drug lord, only to find she isn't so happy about living a pirate's life. However, when the captain finds a new engine that will make him the most successful pirate of all, Suki is the only one who can make it work. Now Firebrandt must find a way to keep his crew fed and his ship supplied while relying on a woman who barely trusts him and while every government in the galaxy hunts him to get the engine back! The book is available as a trade paperback and as an ebook. The trade paperback will be available for $12.95. The ebook will be available for $3.99. "Commodore John Grimes move over. Captain Ellison Firebrandt is coming at ftl to take away your claim to best space opera. 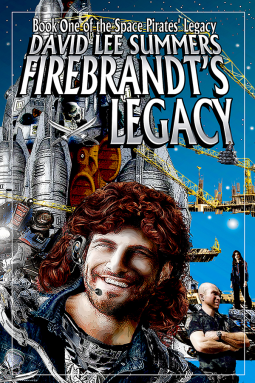 Firebrandt's Legacy by David Lee Summers combines explosive space battles with political intrigue, conniving alien races and the human need to love and belong and serve. The Firebrandt universe is complex and wrapped up in astronomy with careful thought about human expansion and out of this world cosmic science. Join the privateer and his crew on their journey of adventure." Robert E. Vardeman, author of The Klingon Gambit and Darklight Pirates. "'A privateer can be a force for good if he's not too tempted to be a pirate.' Meet Captain Ellison Firebrandt a privateer who walks that fine line - targeting enemy ships, rescuing damsels and protecting priceless relics. Swashbuckling adventures await all who come aboard Legacy." Carol Hightshoe, author of The Chaos Reigns Saga.